It's no secret I'm a cheapskate. My scrounging ways and adoration for Smart Price is recognised by all who know me - or read anything I've written [apart from that time my card was declined for Smart Price tuna, then the adoration temporarily dropped as the shame rocketed.] There are few things worse to a penny pinching bargain-hunter like myself - and that is the old 'Expectation vs Reality' game. You know what I mean; when you order something online that you reckon is a pure bargain - but then when it arrives, you don't know whether to laugh or cry. 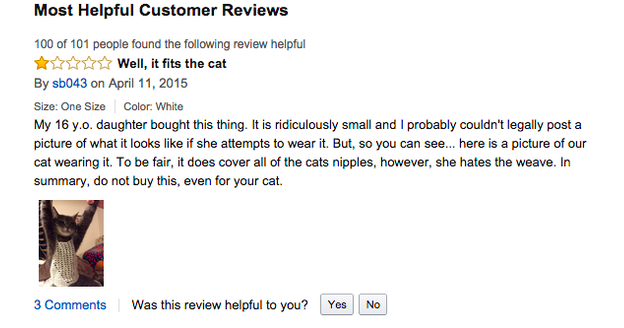 Like that story about that woman who dressed her cat in a crochet crop top. Most of the time, despite being beyond comprehendible levels of broke, I can laugh at my expectation vs reality moments. The 'it's so bad, it's funny' kinda awkward lols. Think that it serves myself right, for ordering something for 50p from Hong Kong with free postage and hoping it would be top quality. However, sometimes it's not really that funny [I am still giggling at that cat in her crop top, though.] Especially when you really wanted something. But then also, sometimes you do strike gold and the 67p necklace you had shipped in from halfway across the world is perfect and it's a triumph like no other. So this series is going to be dedicated to this concept; kind of like the 'Fit or Sh*t?' features I had going on before I became too poor to afford new makeup to test [insert a teary-eyed smiley here.] Follow me on my journey as I test out the cheapest products of the internets, to see if they actually do look like the picture - you can either grab some great bargains or learn a lot from my mistakes! Expectation > Set of 5 rings, I won these at auction on eBay for 75p [but I've seen some sell as low as 29p!] with free shipping. Reality > First things first, it said on the listing that shipping would take 11-23 days from China, but these turned up in less than a week - so fair play to this seller. But did the rings I receive look like the ones in the photo above? Well yes, sort of. They look very much like the ones in the photos, however the key difference to note is that they are extremely small fitting. 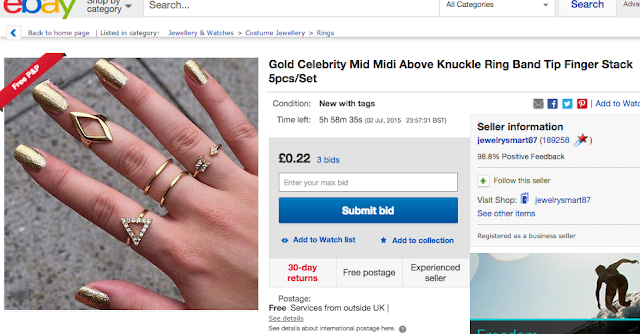 I wanted midi rings, so this is fine by me, but if you're expecting to get any of them over the joint in the middle of your finger; think again [unless you want to lose all circulation to your fingers or are a small child.] The two plain bands will only fit onto my little finger and the others sit very firmly as midi rings. And I haven't got massive sausage fingers either. For me, these rings were well worth the 75p I paid for them. Let's not lie, the quality of them isn't great. And I'd have to knock about 15 years off my total age to get them to fit as anything other than midi rings. But they are cute, interesting midi rings to dress up my fingers and I didn't laugh or cry when I opened them; which is definitely a good sign. You can bid on the exact same rings here.